Lion introduces a slew of changes to the OS X interface—some of them entirely new, others variations on existing features. In either case, they’re going to take some getting used to. Gestures—using one or more fingers to swipe, tap, and pinch on a touch-sensitive screen—have been migrating from the iOS interface to the Mac for some time. In Snow Leopard, you could scroll or swipe with two, three, or four fingers to navigate in windows, drag onscreen elements, or switch between applications. In Lion, the gesture vocabulary has expanded, so much so that interacting with your Mac can feel like working with a giant iPad. There are now thirteen discrete gestures, which you can enable and configure in the Trackpad pane of System Preferences. They can be sorted into two groups. The gestures in one of those groups are what interface designer call “reality based”: the gesture mimics its effect. For example, swiping sideways with three or four fingers (whichever you specify in the More Gestures tab of the Trackpad preference pane) moves you from one space (virtual desktop) to another. In Mission Control, these desktops are arranged in a horizontal array. So swiping sideways is like sliding one desktop out of the way and sliding another one into its place. Similarly, if you spread your thumb and three fingers outward, it reveals your desktop; it’s as if you’re flicking your windows off the screen and out of the away. You reverse the gesture to bring your windows back. To invoke Mission Control, you swipe three or four fingers (depending on your preference) upwards. The metaphor here: Mission Control exists below your active desktop, and you’re sliding the current workspace up and out of the way to see all of your virtual desktops (including full-screen apps and Dashboard). Reversing that swipe from Mission Control slides your regular desktop back into view. Swiping downwards with three or four fingers initiates App Exposé, which reveals all the windows and open documents of the frontmost application. In this case, it’s like you’re drilling down to see the windows just for the one app that’s currently in focus. Again, reversing the gesture exits that view. Finally, if you want a closer look at something on screen, you can pinch with two fingers (or double-tap with two fingers). It’s a gesture that will be familiar to anyone who’s used an iPhone or iPad. Zooming doesn’t work system wide, but you can use the gesture in Safari, iPhoto, Preview, and other apps. 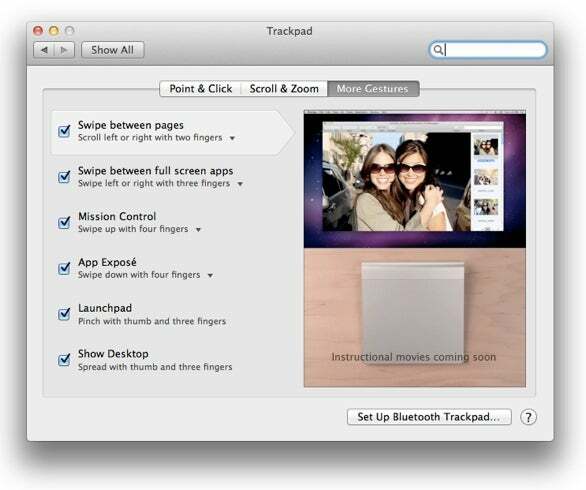 You can configure gestures, or just turn them off altogether, in the Trackpad preference pane. Other gestures in Lion aren’t quite as metaphorically clear. For example, if you move the cursor over a word on screen, then double-tap with three fingers, a popover will appear containing a dictionary definition, synonyms, and a Wikipedia entry for that word. Highlight two or more words before you triple tap, and the dictionary will look up the combined words instead. It’s handy, but not exactly intuitive. Same goes for the pinch with four fingers that invokes Launchpad. Many of the gestures that Lion supports are not necessarily available system-wide; some, for example, currently work only in Apple’s own apps. Presumably third-party support will be forthcoming soon. Most of Lion’s gestures require a Multi-Touch trackpad. That means you’ll need a MacBook of recent vintage or a Magic Trackpad. If you have an older MacBook whose trackpad doesn’t support Multi-Touch, or if you use the Magic Mouse, you’ll be limited to two-finger gestures only. In the latter case, you have several options: You could do without Multi-Touch gestures, you could invest $69 in a Magic Trackpad, or, for many gestures, you could use your keyboard instead. For example, you can switch between full-screen apps by holding down the Control key and pressing the left or right arrow keys. Control-up arrow launches Mission Control; Control-down arrow enters App Exposé. As in Snow Leopard, holding down the Control key while you use your mouse’s scroll wheel zooms in on the screen. Instead of triple-tapping a word to get its definition, you can Control-click on the word instead and choose Look Up in Dictionary. And you can leave the Launchpad icon in your Dock, and then click on that instead of triggering it via its gesture. My take: I suspect that Apple will increasingly embrace Multi-Touch interactions on its desktop operating system, so this is one of those adapt-or-be-left-behind moments. If you're willing to spring for a Magic Trackpad, now may be the time. And if you’re already fond of your iOS device, the new Lion gestures will feel impressively intuitive. While Jason Snell faulted some of the less-intutive gestures in his Lion review, I found that even those Multi-Touch notions quickly became second-nature to me—I love the three-finger double-tap for definitions. You may well need to retrain some muscle memory for certain gestures (since, for example, you now pinch with four fingers instead of swiping down to reveal the desktop), but the adjustment time is short. Just as Lion’s Multi-Touch gestures are clearly influenced by iOS, so too is its support for full-screen apps. When you run an app on the iPhone or iPad, it takes over the entirety of the screen. Now, if you want them too, your Mac apps can do the same. At least, some of them can. While Apple allows any software to leverage Lion’s full-screen functionality, third-party developers will need to update their apps to take advantage of the feature. But already, virtually every major piece of software that Apple makes—Mail, Safari, Terminal, GarageBand, and all the i-Apps—supports full-screen mode. To enter full-screen mode, you click on a the small diagonal-arrow icon at the upper-right corner of the window’s title bar. When you send an app into full-screen mode, the Dock and menu bar zip off the screen. Move your mouse to where the menu bar or Dock should be, and they’ll temporarily reappear. Your full-screen app is technically running in its own space; if you open Mission Control, you’ll see it as one of your desktops. An app’s interface may change in more subtle ways when you enter full-screen mode. Full-screen Safari windows, for example, ditch the Bookmarks Bar; it reappears when you move your mouse into the location bar. Photo Booth becomes a red-curtained, wood-paneled theater in full-screen mode. It’s similar to the way some iOS apps (such as Mail) change their look when you switch between portrait and landscape. Some apps behave differently in full-screen mode, too. FaceTime, for example, will pause your call if switch to another space while you’re running it full-screen. If you switch away while running FaceTime as a regular app, your call continues uninterrupted. Some apps work better in full-screen mode. 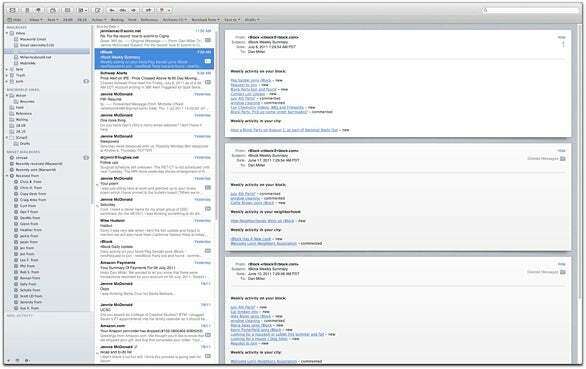 Mail, for example, with its new horizontal layout, works really well. When you’re in full-screen mode, you might miss out on certain Dock alerts. Dock icon badges—like for your unread messages—are obviously invisible when the Dock itself isn’t on the screen. Similarly, flashing Dock badges—such as the ones that Adium employs to alert you to new instant messages—don’t appear while you’re in full-screen mode, unless you move your mouse to where the Dock would normally reside. Lion’s full-screen mode doesn’t work well if you have multiple monitors. When you use an app in full-screen mode, monitors other than your primary display are dead zones: The app fills up your main screen, and other displays show only gray linen wallpaper. You can actually drag a full-screen app from one display to another, if you grab the window’s very top edge. But if your two displays aren’t the same size and resolution, the app may be too big for the other screen—and there’s no way to resize it. My take: There’s a lot to like about full-screen apps, but they definitely take some getting used to. Fortunately, they work with well-ingrained Mac workflows: You can Command-Tab between full-screen and regular apps just as you might expect; clicking on the Dock icon of a full-screen app takes you to its space automatically. And then there's the new Multi-Touch gesture to swipe from one full-screen app to another space. Running some apps full-screen (or specific windows in certain apps, such as Gmail in Safari) could boost your productivity. But some apps simply waste space when run full-screen. And it’s too bad about the lack of multi-monitor support; perhaps Apple considers such setups something for advanced users only, while full-screen apps are more for Mac novices. Or maybe the company simply hasn’t focused on multi-monitor support yet, but will in a future version of Lion; until then, it's hard to recommend the feature to multi-monitor users. One thing that’s likely to throw you off when you first use Lion: The scrolling direction has changed. The default scrolling setting (set in the Trackpad preference pane) is Scroll with Finger Direction: That means the content on the screen moves in the same direction as your scrolling fingers. That reflects another fundamental change in Lion’s interface metaphor: Swiping in Lion moves the page rather than the frame. For example, if you swiped upwards with two fingers in Safari in Snow Leopard, the Web page itself actually moved downwards on the screen: The browser frame moved up, revealing stuff higher up on the page. In Lion, if you swipe up with two fingers in Safari, the Web page itself moves upwards in the frame, so you can see whatever’s below it. Lion’s new scrolling behavior is the same as the iPhone’s and iPad’s, but it’s precisely the opposite of Mac scrolling to date. You’ll probably adjust to the new scrolling direction after a bit of use. If you don’t (or if you don’t want to), you can disable Scroll with Finger Direction on the Scroll & Zoom tab of the Trackpad preference pane. Similarly, in Snow Leopard, if you navigated to a specific Web page in Safari, you could swipe left with three fingers to go back to the previous page; this gesture replicated the action of the browser’s Back button. Metaphorically, the sequence of pages you’ve viewed moves from left to right, like pages in a book, with the current page rightmost in the line. In Snow Leopard, you were moving the frame of the browser to the left to view an earlier page. In Lion, you use a two- or three-finger swipe to the right instead. Metaphorically, you’re moving the current page out of the way to the right, so you can see the page before. Those aren’t the only changes to well-established interface elements. If it knows you’re using a Multi-Touch input device, Lion also ditches the Mac’s traditional scrollbars. Instead, thin scrollbars appear only when you’re actually scrolling—just as they do on iOS devices. That can sometimes get confusing, particularly on Web pages that include separately scrolling blocks; without scrollbars, it can be impossible to know that a section can scroll. If you prefer your scrollbars always visible, visit the General pane of System Preferences. The scrollbar change is initially confusing in other ways, too: Without always-visible scrollbars, you can’t tell at a glance just how long a document is. But again, this is a change that mirrors the iOS experience. As soon as you start to scroll, you get a clear sense of where you in the document, and how long it is. The change doesn’t save oodles of pixels, but you get used to it quickly. My take: So far, I'm not using full-screen apps. I like the conceit, but I can't get full-screen apps to mesh with my workflow. I rely on Dock notifications, and I very frequently switch quickly between apps—looking at multiple app windows simultaneously. If anything, I'd love to see Apple find a Mac OS-influenced way to allow apps to run side by side on the iPad, rather than bringing iOS's full-screen approach to the Mac. I haven't yet set my scrollbars to remain visible at all times, but I'm not 100 percent convinced that Apple's default is the right approach: With an iOS device, all interaction involves touching the screen, so the scrollbars are visible all the time. With the Mac, you see the scrollbars a lot less often (since your hands may be on the keyboard instead), and that kind of feels like a step backwards. The long-awaited ability to resize windows from anywhere, however, is an unequivocally welcome improvement.